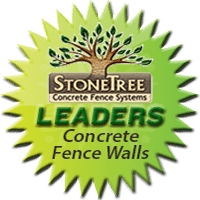 StoneTree® Utility Walls use a Rigid Steel Support to ensure a fast and efficient installation process, while also allowing for future removal of wall sections by heavy duty equipment for access if required. With the increase of copper wire theft, use of a solid secure concrete barrier rather than chain link has become critical, not only to reduce theft and vandalism, but also to protect against accidental death and electrocution. Solid barriers also provide sound reduction and shield the view of critical equipment and machinery. StoneTree® Security Barriers for Utility Sites meet U.S. Department of Homeland Security and NERC requirements to increase security for sensitive and critical assets of the transmission and generating facilities industry. StoneTree® Utility Security Barriers and Homeland Security Fence are the efficient solution to enclose utility projects, protect high-voltage apparatus or specialized utility equipment from unauthorized personnel, and define boundaries. Utility Installations Provide Height, Safety and Reliability! StoneTree® Security Utility Fence Walls Meet UL 752 Level 4 Bullet resistant specification, as well as all security requirements of the DHS and the NERC. Security features such as lighting, surveillance equipment, attachments for razor wire as well as conduit can be integrated into StoneTree® Utility Barrier Walls during both the manufacturing and installation process. Fill out our form to the left to get a free quote for utility fence walls!